In part one of this tutorial series, we used the create-react-app tool to create a working sample app as a starting point for our 'Movie Mojo' gallery app. In part two, we'll get to grips with adding our first custom component to display individual movie cards. We'll also see how using props allows us to customize the appearance of components by passing in data rather than hard coding it. OK, let's create a component! To start with, we'll keep things fairly simple and refactor the header HTML into its own component. Modern React best practices recommend separating out each component in your app into a separate file. We'll be following this principle so, in your projects /src/components/ folder, create a new file called Header.js and open it in a text editor. But because we imported Component directly, we can just use it on its own without any reference to the React variable. It doesn't matter which one you use, and is just down to preference. Note how you don't need to add the .js file extension as this is assumed. Also, because the <Header /> component is in the same folder as our <App /> component, we don't need to specify the full path. 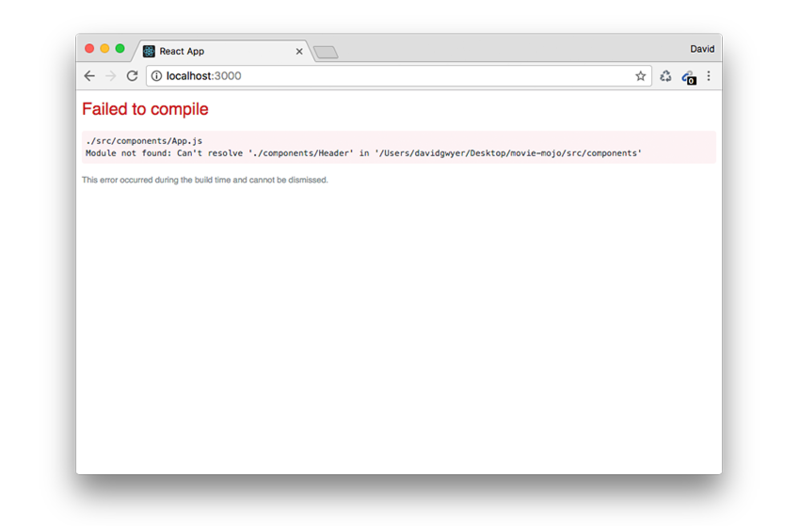 In fact, if you try to use import Header from './components/Header'; from inside App.js, you'll get a compilation error. To complete the <Header /> component, we'll remove the following block of HTML from App.js and add it to Header.js. However, you might have noticed there is an issue. In App.js the <App /> component render method returns what looks like HTML. Yet in Header.js there's just a single call to React.createElement(). What's going on? You're not required to use JSX at all for your React components; it is entirely up to you. But almost all components you'll come across will be written in JSX because it's just so much easier to write. So it should come as no surprise that we'll be using JSX for component definitions throughout the remainder of this tutorial series. While JSX allows us much more flexibility in writing our components, bear in mind that it isn't actual HTML we're writing but an abstraction of it. We can do the same for React components. 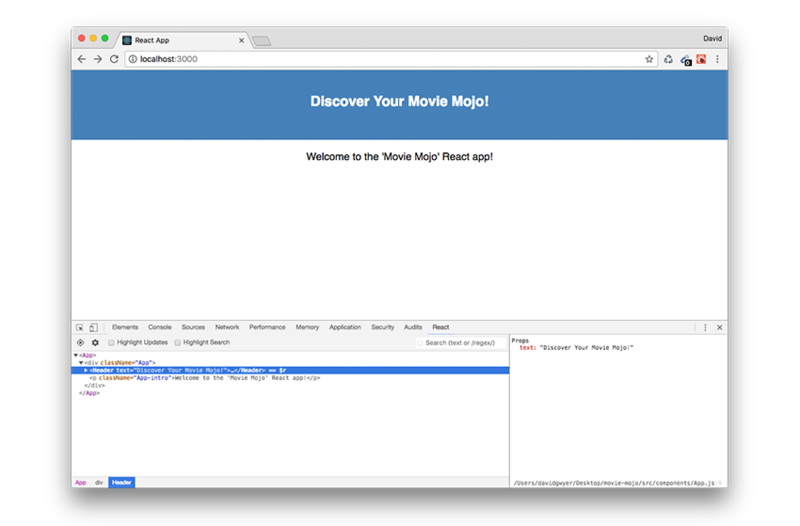 Say we didn't want our header to output the fixed text 'Discover Your Movie Mojo!' all the time. Wouldn't it be better if our header could display any text? Our <Header /> component is now much more generic and doesn't contain a hard-coded string. This is a good practice when writing React components. The more generic you make them, the more reusable they are. This is good news when developing future React apps as you can reuse components from previous projects so you don't have to write everything from scratch. 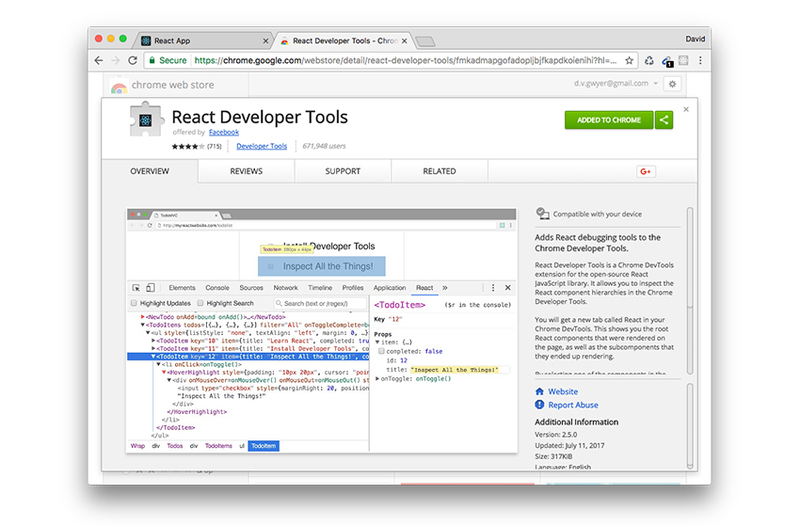 There's a very useful tool available for the Chrome browser that lets you inspect information about your React app. Once it's installed, open your browser inspector tools, and click on the newly available React tab. Notice that instead of HTML elements, you see the hierarchy of React components in your app. Click on the <App /> component to select it. Once selected, information about a component is displayed in the window to the right. The <App /> component doesn't have any props and so the window is empty. But if you select the <Header /> component inside <App /> then you'll see the 'text' prop we passed in. 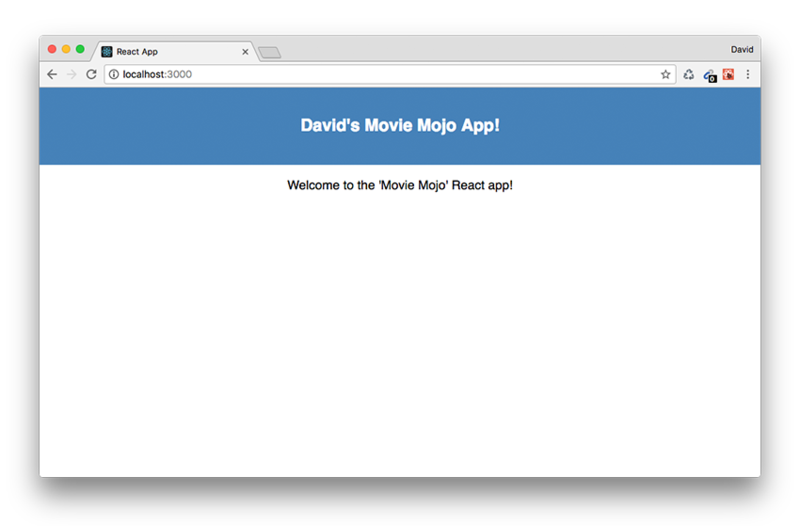 The React developer tools are very useful for debugging, especially when you get onto developing more complex React apps, so it's well worth getting used to using them on simpler apps. 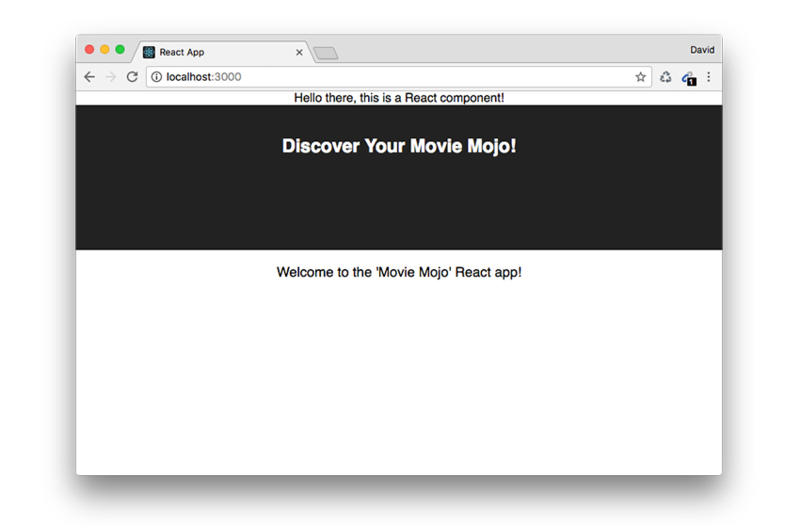 You can also use the React developer tools to inspect your application state, which we'll get into in the next tutorial. In part 3, we'll add state to our app to help us manage our data more effectively.